Nine Lives is a rather unique film. It doesn't have a plot and isn't divided into acts. Rather, it is comprised of nine individual and completely unrelated scenes, each focusing in on one small moment of a woman's life. None of the women have any connection to each other, though the official website says "characters from one story reappear in supporting roles in others". I must have completely missed this because I didn't notice any crossover. To me, it was like they picked nine individual women at random and filmed one particular emotional moment out of each of their lives. Each scene lasts approximately 10 minutes, and is done in one complete camera shot. There is absolutely no cutting away done here. I liked some stories better than others, but there's no doubt that each one was done exceptionally well. The acting here is outstanding. The performances make you believe that these are absolutely real people in real situations. They make it is so easy to empathize with what each of these characters is feeling. By the end of most of the stories, I had nearly forgotten that I was only watching a short, and not a feature length film. Usually it takes a lot of story and character development to get to the points in which we would feel that much for the characters, which I believe is a testament not just to the acting, but to the writing and directing as well. It came as no real surprise to me that it was written and directed by the same person, Rodrigo Garcia. I'm sure this will win some kind of awards, more than it already has that is. The first story is about Sandra (played by (Elpida Carrillo), who is incarcerated in an L.A. county women's prison, and is trying desperately to be a good inmate so that she can have contact with her young daughter. The next story is about Diana (played by Robin Wright Penn) who bumps into an long forgotten lover one night at the supermarket and must then wrestle with all the emotions that come flooding back from her past after she has already moved on to a new life. The third story is about "Holly" (played by Lisa Gay Hamilton) who shows up at the house one day after an apparently long absence and claims to want to patch things up with her father, who appears to have caused her some great deal of pain in the past. After that comes the story of Sonia (played by Holly Hunter), who appears to be in a self-destructive relationship which doesn't get any better when her husband reveals an intimate secret to their close friends. The tale of Samantha (played by Amanda Seyfreid) comes as the fifth story, and is about a bright and beautiful teenage girl elects to go to a college near home so that she can, along with her mother, help to take care of her father. Story number six is about Lorna (played by Amy Brenneman), who finds herself at the funeral of her ex-husband's wife and the topic of gossip that she was somehow involved his wife's suicide. Next is the story of Ruth (played by Sissy Spacek), who is preparing to have a good time with some guy at a motel when thoughts of her husband and children start to seep into her head. After that comes the story of Camille (played by Kathy Baker), who is nervously facing her upcoming surgery for breast cancer with her loving husband by her bedside. And the final story of the film follows Maggie (played by Glenn Close) on an afternoon trip with Maria (played by the adorable Dakota Fanning), a young girl who appears to be her granddaughter. Anyone who knows me knows I'm not a big drama fan. Science fiction... yes. Comedy... yes. Horror... yes. Action... yes. Drama... no. But still, I never got bored though this whole film. On the contrary, several times I found myself wanting to see what happened after the scene ended. So all of you out there who are like me and don't even give dramas a first thought, let alone a second one, you might want to reconsider for this movie. Since each story is short, concise, and to the point, you won't have to wait through any mind-numbingly boring parts. Of course if there's something really cool playing that you wanted to see, like Serenity or Transporter 2 , then yeah, I'd say go see those first. Just don't dismiss this film right off the bat if you find yourself having the opportunity to see it. True, it doesn't have any car chases, aliens, or explosions, but it does have plenty of excitement. 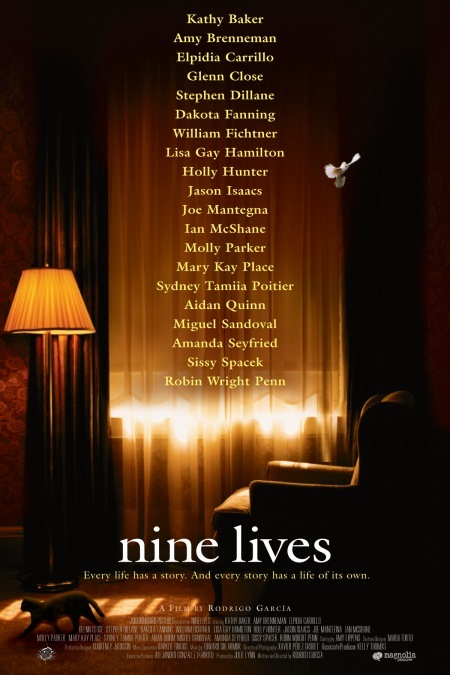 Nine Lives will be released theatrically in select US areas on October 14, and in additional areas on October 28. It was written and directed by Rodrigo Garcia, and stars Camille as Cathy Baker, Lorna as Amy Brennemen, Sandra as Elpidia Carillo, Maggie as Glenn Close, Martin as Stephen Dillane, Maria as Dakota Fanning, Andrew as William Fitcher, Holly as Lisa Gay Harden, Sonia as Holly Hunter, Damian as Jason Isaacs, Richard as Joe Mantegna, Larry as Ian McShane, Lisa as Molly Parker, Alma as Mary Kay Place, Vanessa as Sydney Tamiia Poitier, Henry as Aiden Quinn, Ron as Miguel Sandoval, Samantha as Amanda Seyfried, Ruth as Sissy Spacek, and Diana as Robin Wright Penn. Check out the official website for more.